When the S&Ps took a bold leap on December 26 after plummeting 500 points earlier in the month, few could have imagined what would happen next. It were as though, missing an arm and a leg, a soldier had vaulted from a trench in the heat of the Battle of the Somme and shouted “Vive la France!” In the movie, the soldier is dead before he stumbles and hits the ground. But on Wall Street, U.S. stocks were just beginning their most powerful rally ever. 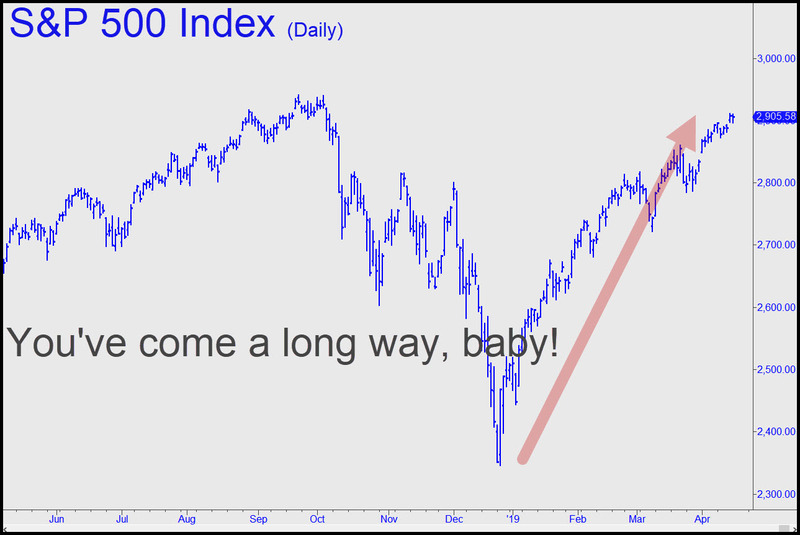 The S&P 500 Index has risen 600 points and is closing fast on the record 2941 recorded in September. The wilding spree has been duplicated in stock exchanges around the world even though global growth is slowing. This shows the irresistible power of central bank stimulus, but also the irrationality of the result. Something’s got to give, and it seems unlikely that the necessary adjustment will come via a huge surge in corporate earnings. Even so, easy credit, aggressive share buybacks and force of habit will continue to fuel stocks until the money runs out. Since no one can say any longer what, exactly, counts as money, it is impossible to estimate when this will occur. The charts are also silent on the question of how high. But gut instinct says we are close to an important top, even if ten years from now it turns out not to have been THE Top.